Having established itself as a world leader in the innovation, manufacturing and distribution of outstanding children’s mobility products, JD Bug runs the gamut in fun and educational experiences for children of all ages and skill levels. JD Bug has led the toy and sporting goods world for more than a decade now with fun and exciting, but safe and educational products that excite and exhilarate the young generation. With an exceptional collection of products arranged in three new appealing categories, JD Bug has once again proven its leadership in fun mobility. Created through pioneering design and ground-breaking innovation, JD Bug’s mobility products convince at every age and skill level. The perfect product range for every age group. To make it effortless for every child to find his and her perfect match, JD Bug is introducing a new classification system into its product range, dividing the products into three categories – JD Bug Kidz, JD Bug Street and JD Bug Xtreme. Each of these three categories has its own identity to more specifically appeal to the corresponding target groups. Each offers an impressive collection of products spanning all categories of skills and ages and providing suitable products for every interest and riding level. Targeted marketing clearly associates the right product to the appropriate age group, allowing retailers to better connect to their customers by more easily identifying the most suitable products. Tots are our business. At JDBug, we’ve made a science of developing mobility products for our youngest riders that combine ergonomics, highest safety standards and early-learning features into that utmost kids’ attraction: Factor Fun. All our products are made of lightweight, robust materials to meet the toughest quality standards, with soft handles and rounded edges to meet parents’ most rigid demands for safety. JDBug Kidz toys train child dexterity, develop and strengthen young muscles and help our youngest achieve a secure sense of balance and trust in their own abilities. Whether riding freestyle with fast turns, jump starts and hair-raising tricks, or casually cruising the neighborhood to-and-from school, Street riders are demanding. JDBug combines the strength and excellence of product with the design and feature innovation that convinces kids who are actively forming their styles and product consciousness… while giving parents’ healthy peace of mind. 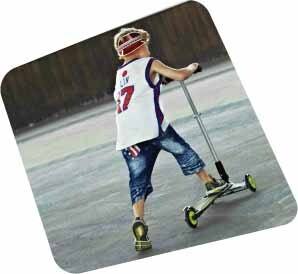 Not for the faint of heart, JDBug scooters for the Xtreme crowd are at the pinnacle of their class – pitting their strength, agility of technique and revolutionary design against crack skater “junkies” who demand the limit in precision, durability and stamina from themselves and their machines. 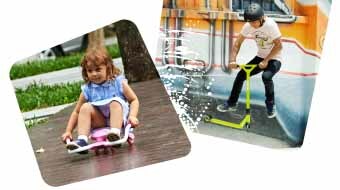 Manufactured from state-of-the-art materials that won’t crack, break or give up, JDBug Xtreme scooters offer you a product definitely in a class with their fearless riders.